Be the first to share your favorite memory, photo or story of Anna Mae. This memorial page is dedicated for family, friends and future generations to celebrate the life of their loved one. 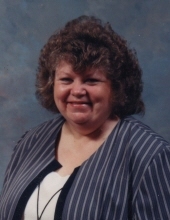 Anna Mae “Poochie” Honaker Clark, 68 years of age of Jolo, WV, departed this life, Wednesday, November 21, 2018 at her home, following a long illness. Born June 28, 1950 in Bradshaw, WV, she was the daughter of the late George Washington Honaker and Rebecca Ellen Vance Honaker. Anna was a homemaker, enjoyed sewing, talking to her many friends, a member of Three Forks Community Church Of The Living God and was of the Christian faith. A loving mother, grandmother, sister and friend. In addition to her parents, she was preceded in death by her husband Leon Clark, twin grandsons Jordan and Joseph McClanahan, sister Pearl Arnett, brothers George, Bill, Fred and Johnny Honaker, mother and father-in-law Clara and Harley Clark. Survivors include her daughter April Clark and companion Barry Ellis of Gilbert, WV, son Timothy Clark and companion Tina Phillips of Jolo, WV; sisters Peggy Cole and husband R. C., Frances Wimmer, JoAnn Rowe; brother Arvil “Boo” Honaker and wife Lynn all of Jolo, WV. She is also survived by her granddaughter Clara Danielle McClanahan of Paynesville, WV; great-grandson Jaylan McClanahan, Summer Phillips and Donathan Phillips whom she loved as her own grandchildren; several nieces, nephews and a special nephew Ryan Honaker who helped with her care, sisters-in-law Phyllis Honaker and Betty Stacy. Funeral service for Anna Mae “Poochie” Honaker Clark will be held at the Theee Forks Community Church Of The Living God, Monday, November 26, 2018 at 12:00 noon with Reverends Hubert Sweeney and Tommy Jenks officiating. Burial will follow in the Jessie Mullins Cemetery on Raysal Hollow Road in Raysal, WV. The family will receive friends at the church, Sunday, November 25, 2018 after 6:00 p.m. with evening service to be held at 7:00 p.m. The family of Anna Mae “Poochie” Honaker Clark have entrusted the care of their loved one to Shortridge-Ramey Funeral Home of Grundy, VA.
"Email Address" would like to share the life celebration of Anna Mae "Poochie" Honaker Clark. Click on the "link" to go to share a favorite memory or leave a condolence message for the family.